Merry Christmas everyone! Hope you are all enjoying some down time with friends and family. And if you are you looking for some more healthy recipes to get started with after the holiday feasting is over, then today’s recipe is a great start! Weight Watchers Casserole Recipes are one my favorite meals to cook this time of year…they are warm and filling, and a breeze to make. 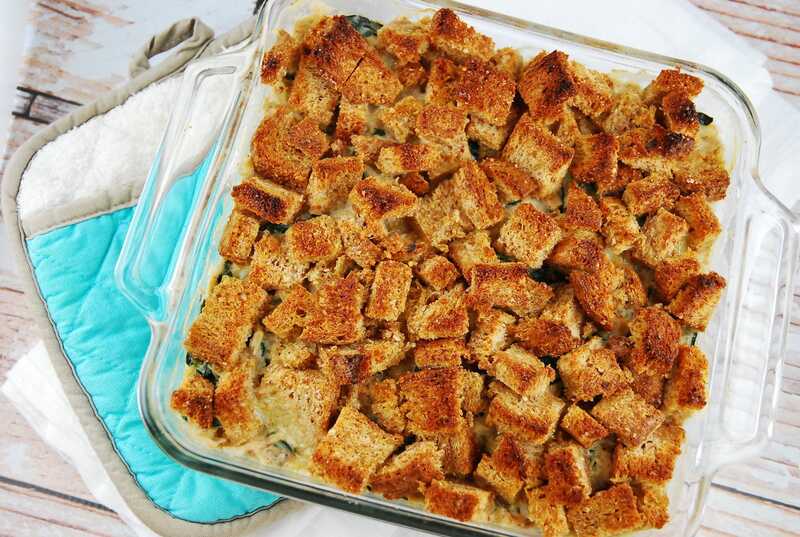 This Chicken and Spinach Casserole has often been one of my old reliable casseroles that I go to whenever I’m too tired to try something new. It’s also a great way to use up leftover rotisserie chicken. Overall, this is a simple Weight Watchers casserole that takes minimal effort and delivers a wonderfully hot and delicious meal for just just a handful of Points. Enjoy! Hot, creamy, and deliciously comforting, this Weight Watchers casserole recipe is simple and satisfying. Loaded with protein and fiber, and topped with a wonderful bread layer that really helps to fill you up. Place diced bread in a large bowl. Toss with olive oil and season with a bit of salt and pepper. Spray a large, nonstick skillet with nonfat cooking spray or an olive oil mister, and set over medium high heat. Add in shallots and garlic, and sauté until onions begin to become translucent; about 2 minutes. Stir in wine, and cook until mostly evaporated; about 5 minutes. Add in the flour, and stir until it’s mixed in well. Slowly stir in the milk, and bring mixture to a low boil. Add in the parmesan and cook, while stirring, until melted; about 1-2 minutes. Toss in spinach leaves, and cook until just wilted, about 2-3 minutes. Remove from heat and add in the chicken; season with salt and pepper as desired. Pour the chicken mixture into prepared baking dish, and top with the bread. Place in oven and bake until bread is golden brown and chicken/spinach mixture is bubbling. I made this last night. It was delicious. I served it with quinoa. I cooked the chicken in the oven first with garden-fresh rosemary, himalayan salt and cracked pepper. Baked the chicken about 20 minutes and sliced into small slivers rather than shredded. The rosemary really made this dish a stand-out! I mixed some into the sauce as well. I will definitely make this again! What size baking dish do you use ? This was wonderful. Very easy to prepare and the portion seemed huge. Is there any way to save your recipes? I don’t see anything to “pin” them nor am I able to set up a recipe box . I would like to save some recipes.they look so good. If you hover over the photo, a Pin It option comes up. We used to work with ZipList as a way to save recipes, but they no longer exist. :( Looking into options! Not sure if I just cannot find it, but is this site Printer friendly? I you scroll down below the recipe (the part that has the red-line box around it, you’ll see a small lime-green button with the words “Printer Friendly” in it. Click that and a print box/pop-up should display with your printer ready to select. Hope this helps! Can you substitute something else for the wine–I just never have wine in the house and after the recipe I would have to throw it out because wine gives me bad headaches. In place of the wine, you can just use chicken broth instead.